OK, this post isn’t going to be to everyone’s taste. I’m not even sure it’s to mine. But the sheer volume of luxe hi tops out there has forced my hand and we’re going to discuss. By luxe, I mean either luxury brands turning their hand at making hi tops (something that has been going on for a few years now, particularly within menswear) or high street brands making luxurious looking trainers. 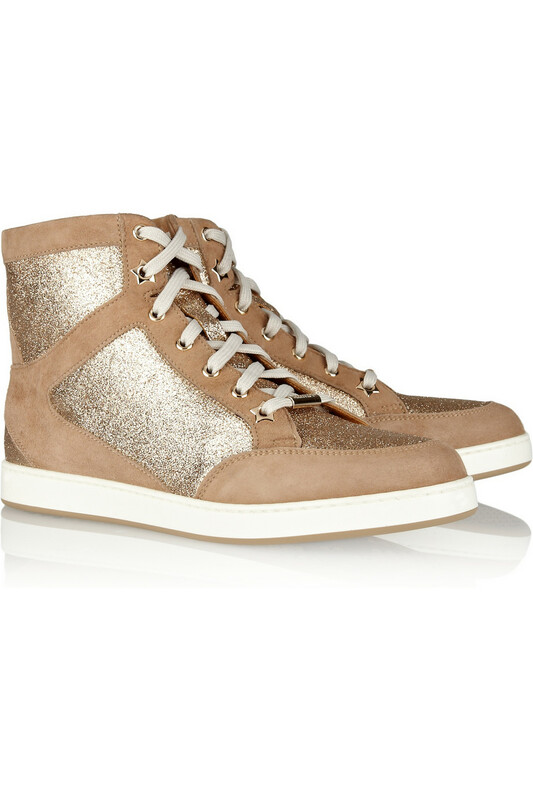 Jimmy Choo Tokyo sneakers, £325, net-a-porter.com BUY ME HERE! I am a big fan of hi tops. I own countless pairs of Converse, plus some Nike, Adidas and Puma, and I love wearing them when I am working on a shoot (comfort factor, anyone?). But when I got my hands on this Gerard Darel pair (below), an old sample from last season, initially I wasn’t sure. Gold trainers? Can I do that? Can a girl who loves the look of natural worn leather really do a metallic shoe? The answer, as you can see from this picture, is yes. Yes! Why the hell not? 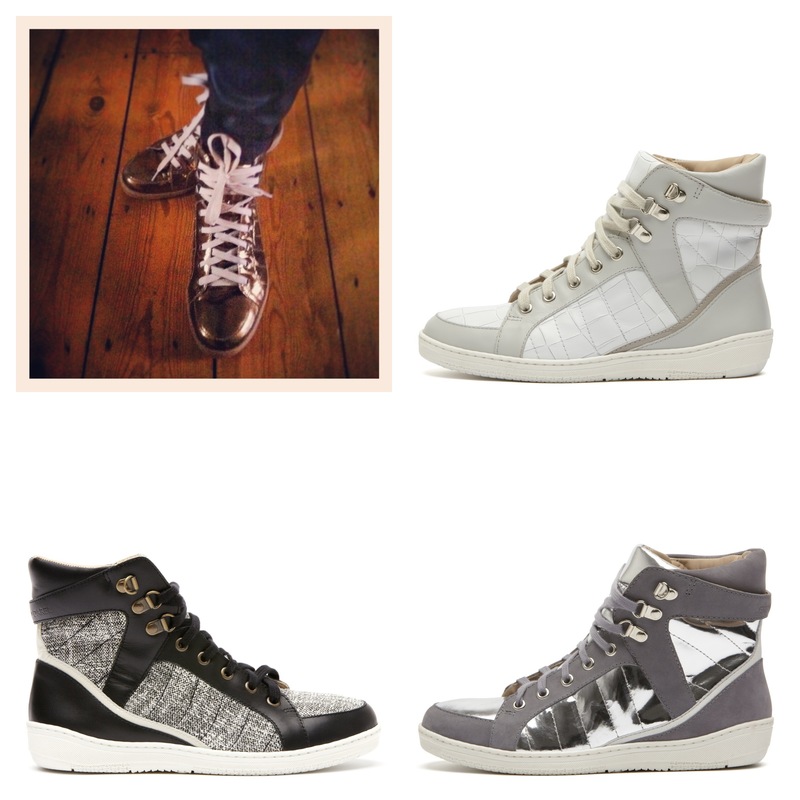 If you carefully team your luxe hi tops with a plain outfit, it’s really not that scary. Today I’m wearing some black pleather trousers from Zara (these are AMAZING, by the way, and are the best leather look I have found) and a black oversized Reiss shirt. Simple. The brand has carried this style through to summer 13 in different colourways (shown here), so you’ll be able to get your mitts on a pair soon. I love the black and tweed pair. 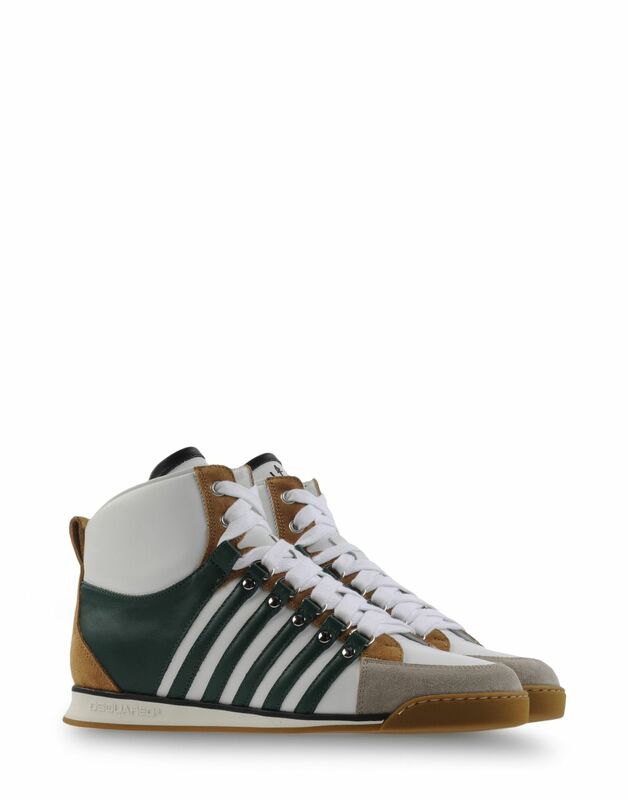 Maison Martin Margiela, £390, shoescribe.com BUY ME HERE! So what else is out there? We’ll start with some of the more expensive options. They will have you drooling, I’m afraid, but I reckon if you’re going to spend a lot of money on some designer shoes, it makes MUCH more sense to buy a comfortable pair of incredible trainers than some silly heels you can’t even walk in. Katie Grand Loves Hogan, £355, store.hogan.com BUY ME HERE! Love is the word when we come to these green beauties, designed by Love Magazine’s editor-in-chief Katie Grand for Italian brand Hogan. They are achingly cool, especially when modelled by Edie Campbell in the brand’s campaign imagery. Have I talked you into it yet? 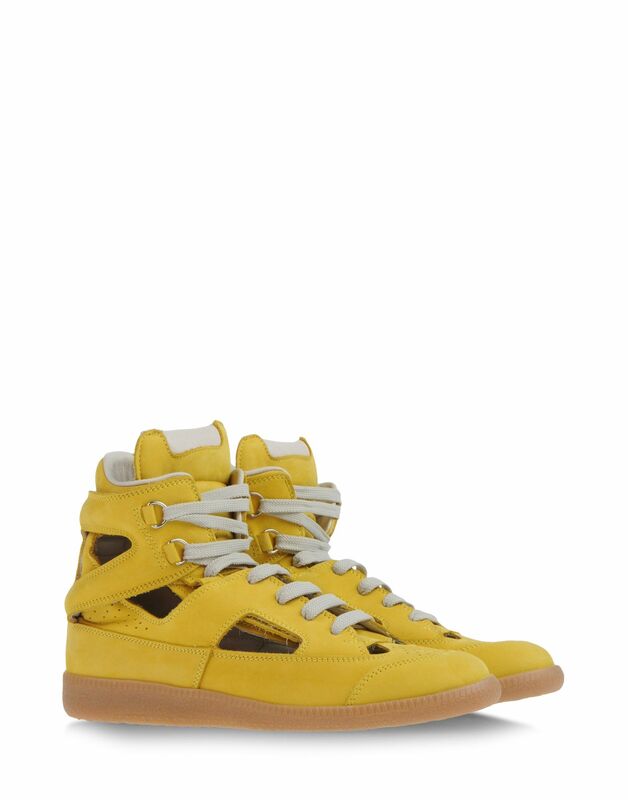 As far as affordable luxe-style hi tops are concerned, good old Toppers has jumped on the bandwagon, as has Zara. 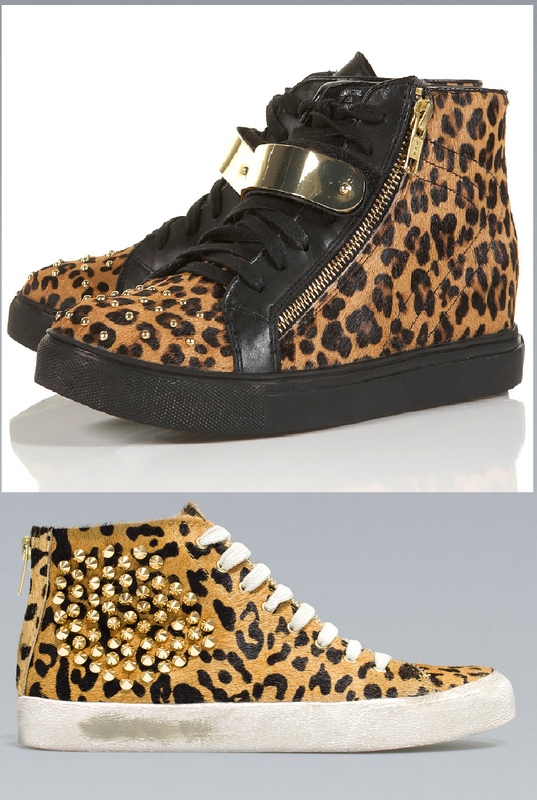 These, our two most reliable high street stores for picking up on high end trends and translating them so the rest of us can afford them, have both gone for a spattering of leopard print. Leopard has become as easy-to-wear as a Breton stripe in the past few years, which is no bad thing in my book. Of course, the best value (and best functioning) trainers tend to come from sports brands, and Nike’s Dunk hi tops can also be found in interesting finishes. Keep an eye out for its regular Liberty collaborations if you’re fond of a floral print. I’d love to know what you think. Would you step out in a pair of luxe hi tops? Or are they a step too far? I’ll leave you with my absolute favourite pick of the bunch from DSquared2. Because for me, when it comes to sporty footwear, you can’t do better than retro. My thinking recently shifted from “hi tops, ugh!” to “Possibly …”. 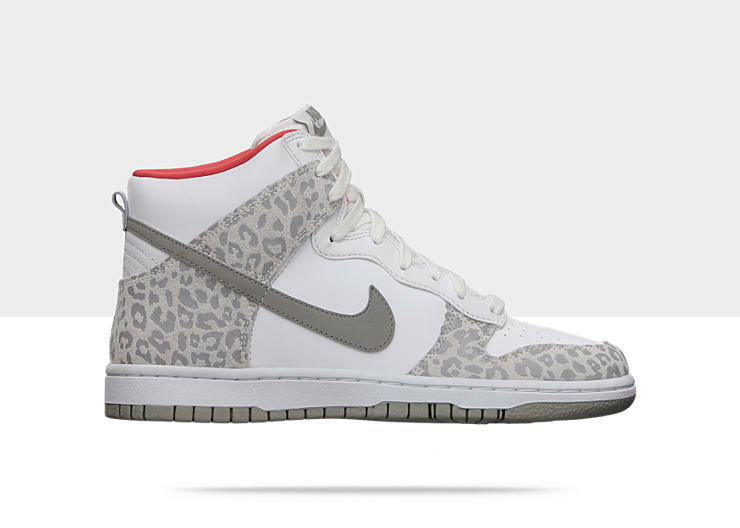 I really like the animal prints pairs. I’ve also just had a flashback to the mid 80s – I got a pair of red hi tops from Chelsea Girl which I wore with jeans (small roll ups) and a striped, button down shirt (with a dominant red stripe). I loved that outfit! Though it was totally unappreciated by everyone else in my small north wales town. Philistines! Haha! Yes, I know the feeling. I’m from a small town too. Would love to see a picture of you in the outfit – can you tweet one to me? It sounds cool!